All Saints Church in Hovingham is part of the Street Parishes and was rebuilt in 1860 by Marcus Worsley retaining its Saxon tower and other important Saxon carvings. There is little to betray Hovingham’s comparatively recent rebuilding, the Saxon provenance of the tower is immediately apparent. It is believed the tower dates to just before 1066 and it is clear that some of the tower’s masonry was reused from an even earlier church. It is thought Saxon landowner, Orm, probably commissioned Hovingham’s first rebuilding. There are three known fragments from the early church: an eighth century "Anglican” cross over the west door; the ninth century "Annunciation Stone” in the Lady Chapel; and a tenth century "Wheel” cross on the south side of the tower. Within the chancel there is also a preserved Viking cross that was formerly built into the tower and was removed for preservation in 1925. Within the church, the reordered Gothic of the nave and aisles contrast sharply with the unfaced stonework of the Saxon tower arch and its surrounding masonry. There is a conspicuous course of herringbone masonry that is such a delightful feature of the Saxon period. The rebuilt nave, chancel and north aisle follow the original floor plan and were rebuilt in thirteenth century style. Two lancet windows were retained in the chancel. The south aisle was added at this time, with the Lady Chapel following as recently as 1937. There are several memorials and some interesting stained glass windows. 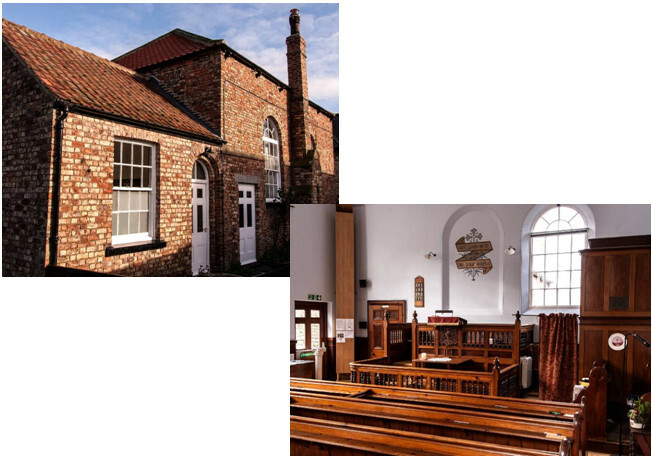 Hovingham Methodist Chapel is part of the Ryedale Methodist Circuit in the heart of an area of outstanding natural beauty in North Yorkshire. The Chapel was originally the Wesleyan Chapel. Built in 1815 but there were Dissenters Meeting Houses in the village in the 1760s. The ‘traditional’ service is held on Sundays at 10.30am. On the fifth Sunday in the month the service is shared with Slingsby Chapel, who alternate hosting this service, which is concluded with tea and biscuits and a chat afterwards! Certain services - Christmas, Easter, Mothering Sunday, Remembrance Day etc are shared with Hovingham Church of England and the Chapel takes its turn hosting Benefice Services. The Church of England are also invited to our important Covenant Service in January. Members help in the organising of the ecumenical Women’s Fellowship, School Assemblies at Hovingham Church of England School and have become practised performers in Open the Book team. There has been a recent renovation programme undertaken. The roof is sound, the heating is entering the 21st century and we have aspired to a new toilet and a new kitchenette. Mass is every Sunday at 9.00am at St Aidan's Church, Oswaldkirk. Hovingham contact is Rob Thompson, who can be contacted on 01653 628640.